From Barnhouse Stone, seen here, go northwest just about 700 meters along the B 9055 road to the Stones of Stenness at HY 307 125. 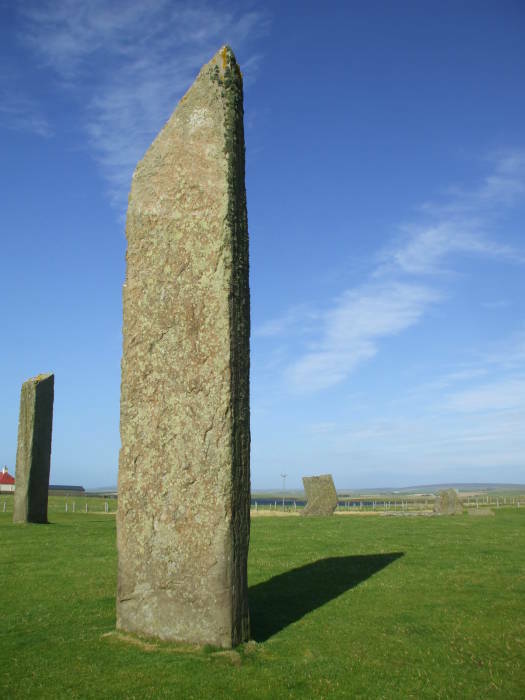 Some of the standing stones are visible in front of the loch at far left in this picture. 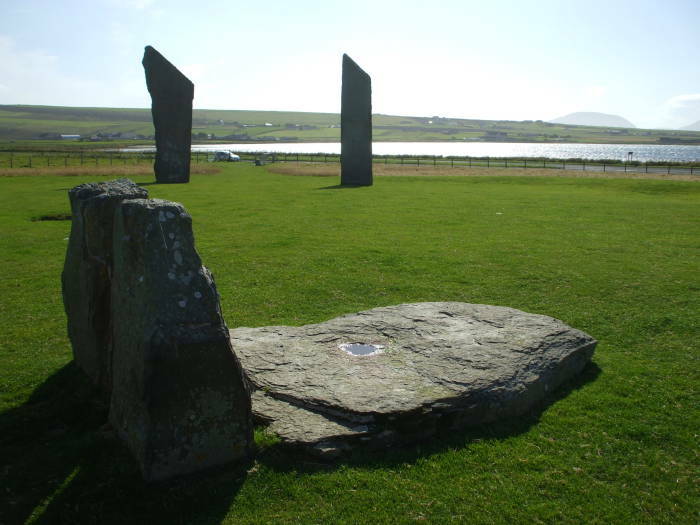 Stenness is pronounced "Stain-Is", from the Old Norse for stone headland. 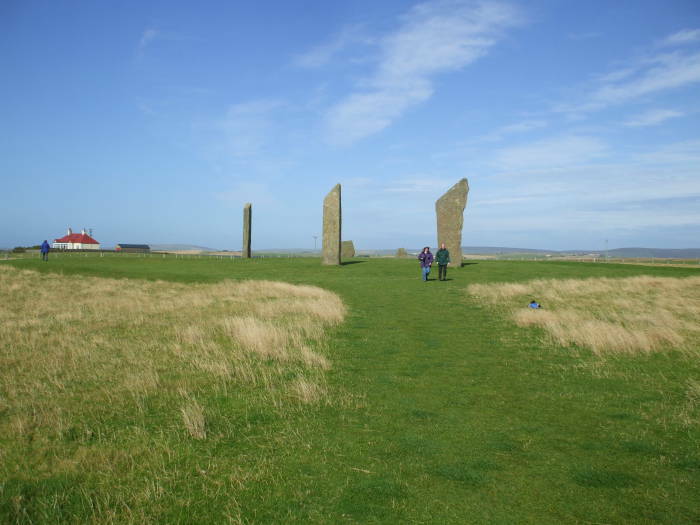 The Stones of Stenness are the remains of a henge, a megalithic circle with a ditch and bank around a cluster of large stones. 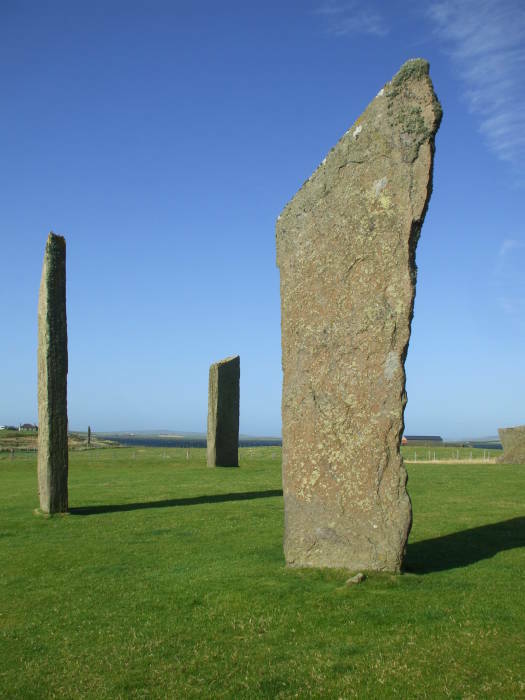 Six large megaliths remain, the largest of them standing six meters above ground. Originally there were twelve stones in an ellipse with a major axis of about 32 meters. A ditch surrounded the stone circle. This ditch was 44 meters in diameter, about 2 meters deep and 7 meters wide. An earth bank was then outside the ditch. 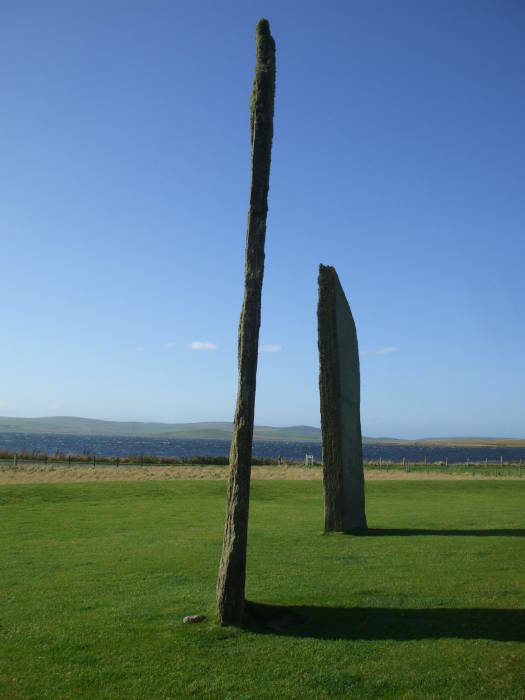 The Stones of Stenness are extremely thin in comparison to their width and height. They are only very approximately rectangular, most have an angled top edge. One, visible across the circle here, has a bent shape like a sideways "V". There's a large stone "hearth" near the center of the stone circle Bones of cattle, sheep, wolves and dogs were found in the ditch forming the outer perimeter of the henge. This suggest some function of ritual sacrifice and feasting. This henge complex was constructed around 3100 BC, making it one of the oldest anywhere in Britain. Compare this to Stonehenge, where the circular earthern henge was built around 3100 BC but the iconic standing stones were not erected until around 2200 BC. 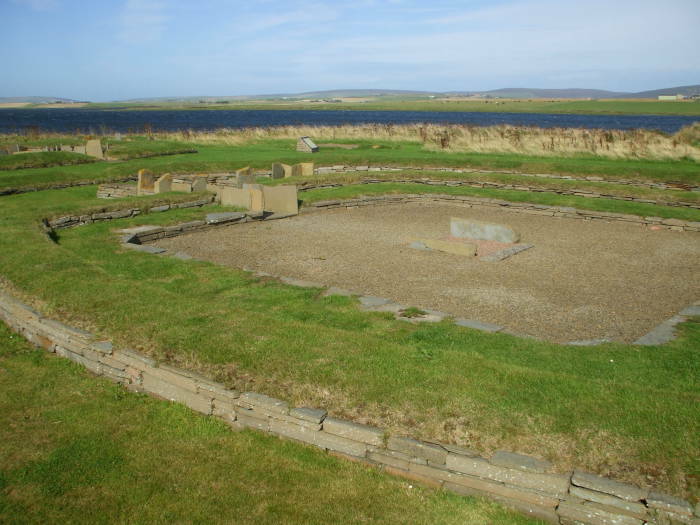 The Barnhouse Settlement is adjacent to the Stones of Stenness, you can see that stone circle in the background here. The Barnhouse Settlement is a cluster of at least fifteen buildings on the shore of Loch Harray, occupied from 3200 to 2950 BC. The ditch and bank around the Stones of Stenness had a single opening in the direction of the settlement. 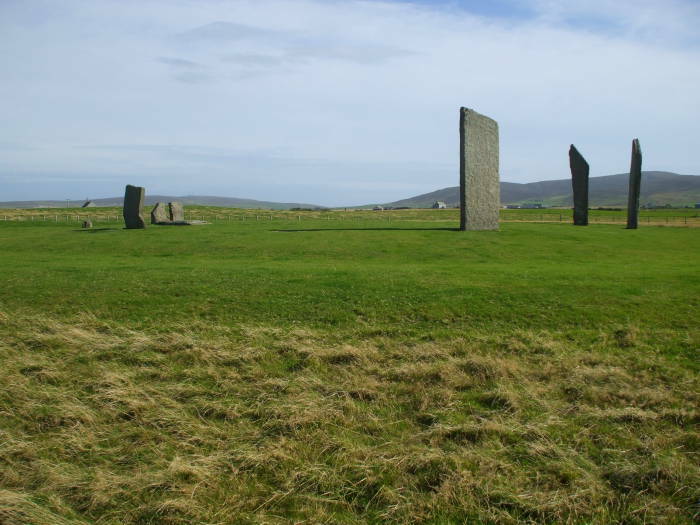 Either the Stones of Stenness formed the ritual center for this community, or the settlement existed to operate the ritual center. 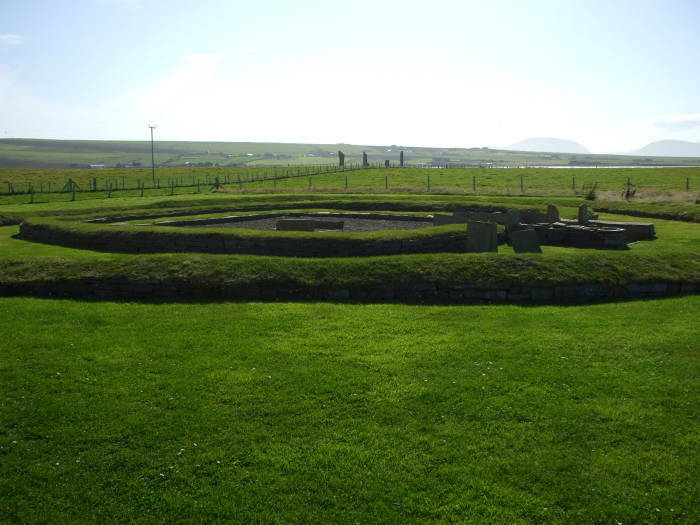 The homes were larger than those at Skara Brae, several kilometers to the northwest on the western coast of Mainland, but they had common design elements. Each house had a central stone hearth, recessed bed boxes formed by stone panels, and stone "dressers" or storage cabinets. Grooved ware pottery common to that period was also discovered here. 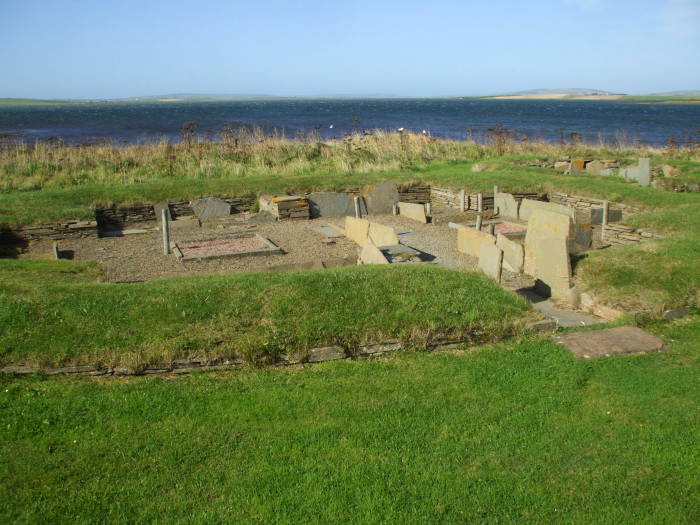 The structures of the Barnhouse Settlement were free-standing, not buried in a midden heap like those at Skara Brae. One of the buildings is larger, with an entrance facing northwest and aligned so the midsummer sunset shines along its entrance passageway. Next we'll walk a short distance north along the road to the Ring of Brodgar.